The Trump administration has faced an onslaught of questions pertaining to the spending habits of its top leaders, but at least one agency is trying to learn from its own scandal. 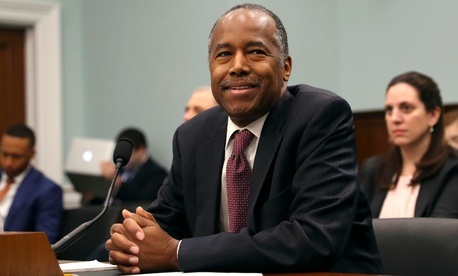 The Housing and Urban Development Department fell into hot water when officials approved $31,000 in spending on new furniture for Secretary Ben Carson’s office. Carson initially denied any role in the spending before ceding to public pressure and canceling the order. In the aftermath of that controversy, HUD established a task force to combat wasteful spending in the department. Irving Dennis, HUD's chief financial officer who was confirmed late last year, is overseeing it and designing a new plan to "protect the financial integrity of the agency and correct lax internal processes and controls." Dennis, who spent 37 years at Ernst & Young before taking his first job in government, told Government Executive in an interview that he was looking to improve HUD's management of people, processes and technology. While he aimed to hit the ground running, he admitted there was a learning curve. "I tell my people, 'I know nothing about government,' " Dennis said. " 'I know about process, I know about excellence. I can help with that. You gotta help me with the government side.' "
Dennis was sworn into office in January, and within an hour was at his desk diving into his work with no orientation. He spent his first 100 days learning how HUD, and the federal bureaucracy writ large, operated. He quickly found the department's finances were messy, its tech was outdated and its people, while dedicated to the mission, had no clear guidance on how to alleviate the problems. Controls over the spending of taxpayer dollars were not functioning properly, an array of "material weaknesses" had not been addressed and the inspector general had identified 341 areas for improvement in HUD's finances. HUD's employees were so focused on delivering on the department's mission they had abandoned the requisite structures to enable it. "It's a little bit of mission before process," Dennis said. "My mantra around here is, 'If we had process before mission, we'd have a better mission.' "
To address those issues, Dennis, in collaboration with Carson, set up the task force, which is made up of the CFO and 11 other career and political employees scattered throughout the department. Bringing people from different programs together, Dennis said, should help tear down the silos that had inhibited the department. The committee has met weekly since its inception and has created five project management organizations, each with its own distinct leadership. The group has already established 25 areas for process improvements, 15 of which it hopes to address in the short term. Goals range from big picture changes that will require funding from Congress and three-to-five years to complete, to simpler objectives such as putting a policy in place for furniture purchases by presidentially appointed, Senate-confirmed appointees (Dennis also wants to establish an orientation program for HUD so future politicals have an easier time transitioning than he did). "If you have good processes, good education and good understanding, that helps prevent a lot of that," Dennis said of Carson's scandal. "You're always going to have stuff that happens, but you can really mitigate a lot of it with just a good education, and an understanding and policies and procedures." Dennis also wants Congress' help to boost discipline at HUD. If programmatic offices are failing to meet their requirements in terms of reporting and instituting controls on their grant process, he would like to give them less money. For now, he said, providing employees with better oversight and education into the importance of what the task force is trying to accomplish, increasing reporting, and changing the culture and mindset of the workforce so it takes pride in its work will boost accountability. So far, employees are appreciative of Dennis' efforts, he said. "The folks around here are really welcoming the change and welcoming a lot of the thoughts that we're putting in place," he said. Other projects involve closing out reports for completed grants and balancing out the department's accounts on a monthly, rather than annual, basis. Dennis is working closely with the inspector general's office, which he said so far has also been appreciative of his efforts. He is also working with grant recipients to ensure they have controls in place to guarantee taxpayer dollars are going to the right places. HUD has awarded $28 billion in grants in the wake of the 2017 hurricane season through its Community Development Block Grant - Disaster Recovery Program—largely to Puerto Rico and the U.S. Virgin Islands—an unprecedented figure for the department. Part of Dennis' reforms are to ensure those territories, which are not used to such an influx of aid, have the right technology and processes in place to ensure the grants are spent wisely. While Dennis is looking to bring many of the approaches he employed during his career in the private sector to HUD, he noted there were some major obstacles. Hiring, budgeting and procurement number among the activities he said were "much, much slower" than he was used to. In part because of that pace, he conceded his project of turning around HUD's finances still has a long way to go. "I like to think of this as trying to pull the Titanic out of the ocean," Dennis said. "I wish we were on the ocean. I wish we were floating."